Immigration and Customs Enforcement agents in February in Los Angeles. The mayor of the city has asked ICE agents not to identify themselves as police during operations. U.S. Immigration and Customs Enforcement officers and Los Angeles police officers enter a house during a joint operation in 2009. Officials in Los Angeles have asked Immigration and Customs Enforcement agents working in the city not to identify themselves as police. "In Los Angeles, the term 'police' is synonymous with the Los Angeles Police Department, so for ICE agents to represent themselves as police misleads the public into believing they are interacting with LAPD. This is especially corrosive given that to advance public safety, the LAPD does not initiate police action with the objective of determining a person's immigration status." The letter cited reporting by the Los Angeles Times that described an agent for Immigration and Customs Enforcement, which is part of the U.S. Department of Homeland Security, identifying him or herself as a police officer. 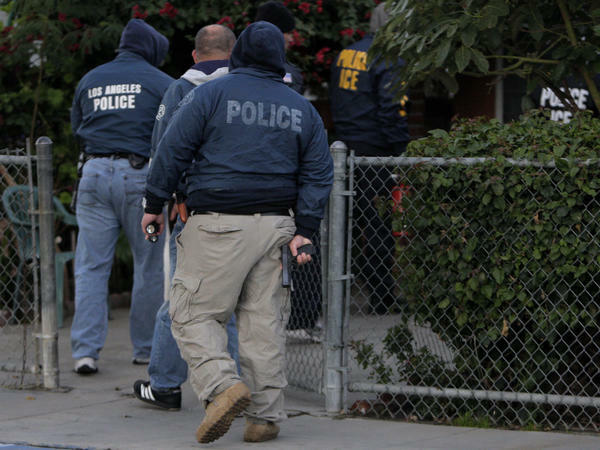 "A team of ICE agents in Los Angeles approached the house of a man targeted for deportation.
" 'Good morning, police,' one agent announced in the pre-dawn darkness. "A man opened the door moments later.
" 'Good morning, how you doing? I'm a police officer. We're doing an investigation,' the agent said." "Agents generally are not armed with search or arrest warrants when they try to detain someone on suspicion of being in the country illegally. Without a warrant, they cannot force their way into someone's home and, instead must receive consent from an adult to enter." 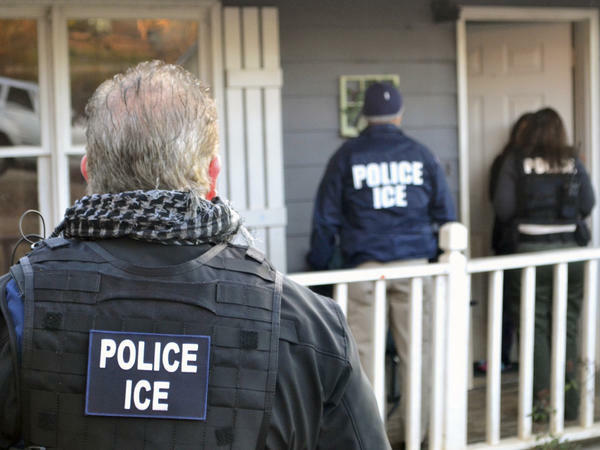 A spokeswoman for Immigration and Customs Enforcement in the western region, Virginia Kice, said ICE agents wear protective vests during operations that often say both "ICE" and "Police" on them. It's up to individual agents how they configure the identifying patches that attach to the vests — for example, whether they wear the words on their chests or backs. In a statement, Kice acknowledged, "As a standard practice, special agents and officers with U.S. Immigration and Customs Enforcement (ICE) may initially identify themselves as 'police' during an encounter because it is the universally recognized term for law enforcement and our personnel routinely interact with individuals from around the world." "In the often dangerous law enforcement arena, being able to immediately identify yourself as law enforcement may be a life-or-death issue," the statement continued. Agents for the Bureau of Alcohol, Tobacco, Firearms and Explosives also use the word "police" to identify themselves sometimes. Mary Markos, a spokeswoman for the ATF, wrote in an email to NPR, "if [ATF agents] are in the process of a federal search warrant where we 'knock and announce' at the door, we would say police. Other times, our agents would show their credentials and announce themselves as ATF Special Agents." A spokesman for the U.S. Drug Enforcement Agency told NPR that agents generally identify themselves by saying "DEA, search warrant," if they are knocking on a door, or by describing themselves as agents for the DEA, not as police. The disagreement between Los Angeles and federal officials is the latest in a series of public arguments about how local governments do, or don't, assist federal agents operating in their cities after executive actions were issued to crack down on people living in the U.S. illegally. In January, President Trump threatened to withhold federal funds to so-called sanctuary cities. In New York City this week, "ICE officials publicly assailed the city government after an undocumented Salvadoran teenager with suspected ties to a violent gang ... was released from Rikers Island despite a federal request for assistance with his deportation," reported The New York Times. In Miami-Dade County, the mayor ordered county jails to honor federal detention requests from the Department of Homeland Security, reversing the county's earlier policy, as The Miami Herald reported. And in Denver, the federal immigration agency accused the local sheriff of notifying ICE agents too late for agents to act before the sheriff's department released from the county jail a man suspected of being in the country illegally, according to the local NBC News affiliate. In an interview with NPR's Weekend All Things Considered, Austin, Texas, Mayor Steve Adler discussed the tension between local police and federal immigration authorities. "There's a lot of uncertainty here," Adler said. "It's, unfortunately, undermining a lot of the trust relationship that had been built up with our public safety officials over time. It's sending people back into the darkness."